Heat a large saucepan of water to boiling. Add one teaspoon of the olive oil to the water. Add the vermicelli noodles. Boil until the pasta is cooked but firm. Drain but do not rinse the cooked pasta. Heat a large frying pan over medium heat. Add the remaining olive oil. Add the sliced garlic cloves to the heated oil. Stir. Just before the garlic begins to turn golden, stir in the chopped parsley. Quickly transfer the drained but still moist vermicelli to the oil and parsley in the frying pan. 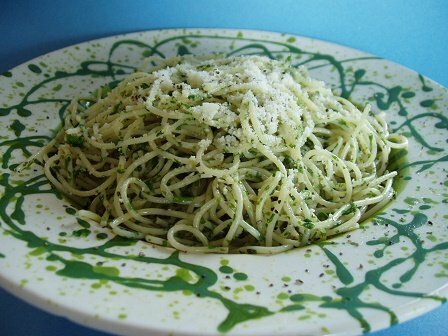 Toss the pasta in the frying pan in order to coat it evenly with the olive oil, garlic, and parsley. Remove from the heat. Transfer the pasta to serving dishes. Top the pasta with the freshly grated Romano cheese and coarsely ground pepper.